Today is my birthday. One which I knew would always be very different from the pomp and circumstance of my 40th last year. But, this one has special. More so in many ways, because I’ve never felt the presence and love of my family and friends so strongly. My children brought tea up this morning and had conspired to buy a Pandora ring with my birthstone- pink opal. I am so overwhelmed by the thought and organisation that this took. I treasure it. 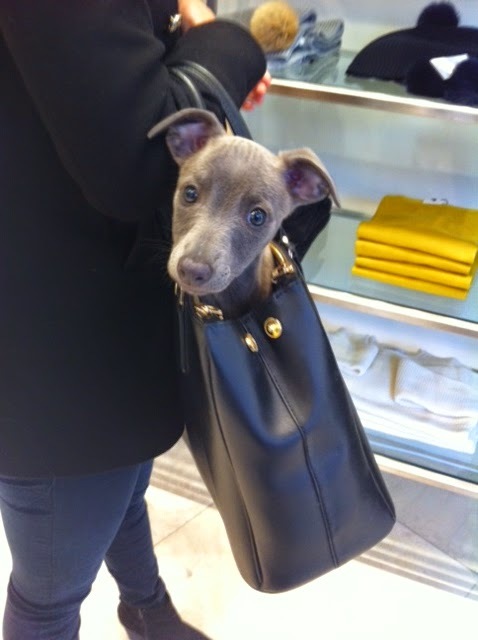 My gorgeous, wonderful friend Annemarie and I went to Harrogate for shopping and lunch and where puppies are carried in Prada. She’d booked Jamie Oliver’s as a surprise. The butternut squash and chilli soup taster was delicious. And my rump steak was perfect. I’m a year older, a year wiser, infinitely stronger and ready for the next chapter. I opened this card last week from my friend Sally (I have three friends Sally, each as fab as the next). I have the glitter. I have the fabulous high heels. Happy birthday Liz. Harrogate is lovely – I should make the effort to go there more as it's not really that far away. Lunch at Jamies' looks fab! Ha ha!! He was too short for either of us but very charming! !